It's a battle of two titans. The iPhone XS Max absolutely crushed every competing smartphone in real-world speed tests since it came out, but it looks like its reign may be over. In a new speed test pitting the iPhone XS Max against the Galaxy S10+, Apple’s flagship device finally loses its speed test crown. Apple’s best phones haven’t lost to Samsung’s flagship devices since the Note 5 came out. The iPhone XS Max actually beat the S10+ on the first lap but couldn’t keep up on the second. The iPhone XS Max loses its position when it came time to keep Microsoft Word and Excel open on the second lap with its memory. iPhone XS Max bested the Galaxy S10+ by four seconds the first lap, then fell 16 seconds behind on the last lap. Still, it was a tight and impressive race. The Galaxy S10+ has 8GB of RAM compared to the 4GB of RAM on the XS Max. 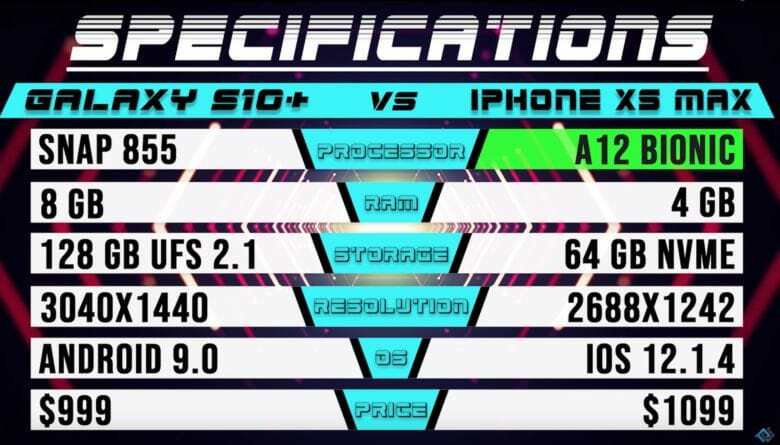 The lack of RAM didn’t hurt the iPhone XS Max in its battle with the regular S10 that packs 8GB of RAM. The S10+ has a faster e Galaxy S10+ Snapdragon 855 processor than the regular S10 though and that appears to have made all the difference.